Flume nets of various lengths and a 3-m seine were used to sample the fishes and macrocrustaceans using a flooded Louisiana salt marsh and the adjacent tidal creek. The experiment allowed for species-specific comparisons of the flooded marsh at the creek edge versus the interior. Of the 37,667 organisms collected in flume nets from January through November 1989, 89% were decapods (nine species) and 11% were fish (29 species). An additional 18,539 organisms (75% decapods and 25% fish) were collected from concurrent seine samples taken from July through November. 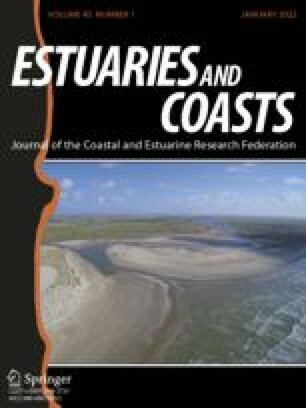 Comparison of catches among different flume lengths and low tide versus high tide seine collections revealed distinct patterns of marsh habitat utilization. Densities of most organisms were highest within 3 m of the water’s edge, but significant numbers of marsh-resident fish species used the interior marshes. The edge marshes appeared to be used by both transient and resident species; however, the interior marshes were used primarily by marsh-resident species (Cyprinodontiformes andPalaemonetes sp.) that are excellent food sources for adult transient-species. Four zonations of marsh use are described for transients, residents, and rare species.